Everybody knows they wouldn’t go rock climbing hundreds of feet in the air without a rope to catch them if they fall. So why do investors let their stock market gains climb higher and higher without protecting them from a big drop in the stock market? If we thought about it long enough, we could probably come up with hundreds of excuses not to sell a stock that has made us a lot of money, even when it starts to decline. Just think back to the Financial Crisis with Wachovia or back to JDS Uniphase during the technology boom and bust of the 1990’s. Neither of these companies exists in their prior form today. Just as you would not go rock climbing without a safety rope, you should not go investing without a safety plan either… and we don’t. As you know, our investment process uses trailing stop-losses as our last line of defense against falling stock prices. For those that don’t remember what a trailing stop-loss is, it’s the “rock climbers rope” that allows our stocks to climb higher and higher until they start to fall. Once, they start to fall the stop-loss kicks in letting us know it is time to sell before the stock falls too far. This is why we are selling a long-time winner. Even as the broader stock market is hitting new highs, one stock in our “FA Dividend Builder” portfolio has been in decline. We made our very first purchase of Walgreens (WBA) during the 4th quarter of 2011. Since that time, the stock has continued to climb. It hit a new all-time high price on August 5, 2015, and hasn’t done much since that time. Recently, the price has been in decline and has now fallen far enough from its 2015 high that it has triggered our stop-loss that was set at 25% from its peak price. While not all investors own the FA Dividend Builder portfolio, I share this information with you to remind you of how we aim to protect our investments from catastrophic declines. We apply these same principals to all of our managed accounts. It works for all types of investments: stocks, bonds, mutual fund, ETFs, options and more. 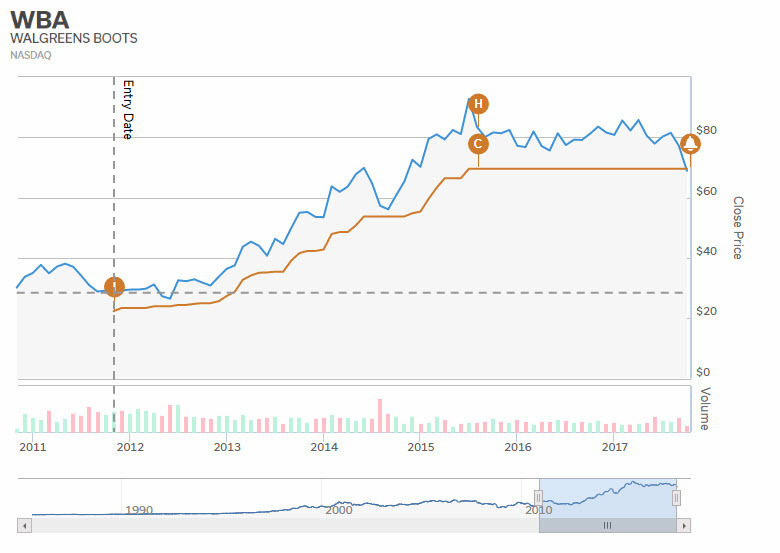 Today we say goodbye to Walgreens (WBA), a stock we have liked and owned for more than five years. By many counts, it has been a trophy stock, one to brag about and yet, we are disciplined investors and when it is time to sell we sell. No questions asked. If something I said has sparked a thought, idea or question, please give me a call at (800) 722-5862 or send me a quick email to [Kern at FAinvestors dot com] and we can discuss what’s on your mind.